Close-fitting, underlined and lined top has boning, princess seams, back separating zipper and strapless or sleeve variations. Machine Embroidery. Semi-fitted or very loose lined skirt, slightly flared or flared, floor length at center front, has back zipper and shaped hem. Notions: Top A, B, C, D: 14" Separating Zipper, 31/8 yds. of 1/4" Covered Boning, Hooks and Eyes. Also for A: (Optional) 21/4 yds. of Approximately 1/2" Beaded Trim and 1 yd. of 21/2" - 31/2" Appliques or One Large Triangular Bridal Applique. For B: (Optional) One Large Triangular Bridal Applique. For C: (Optional) 13/4 yds. of Approximately 1/2" Beaded Trim and One Large Triangular Bridal Applique. 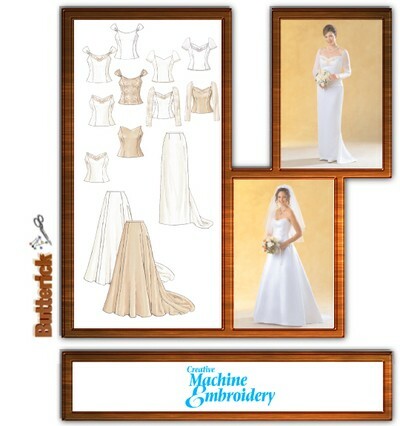 For D: (Optional) Embroidery Thread and Beads or One Large Triangular Bridal Applique. Skirt E, F: 7" Zipper or 7" - 9" Invisible Zipper, One Hook and Eye Closure.